We present this beautiful Keerthanai on Sri Maha Periva titled "Kanchiyin Thava Naathan" performed by our Kanchi Periva Forum Bhajan Group. Kanchiyin Thava Nathan - A humble submission at the Divine Feet of Sri Maha Periva by Kanchi Periva Forum Bhajan Group during Sri Maha Periva's Aradhana day event held at Mylapore Sri Kapaleeswarar Temple, Chennai on 02-Jan-2019. For further details visit www.periva.proboards.com or www.periva.org - please contact us at bhajans@periva.org if you want the Bhajan group to deliver these songs in your own area / Pooja - this is a service and submission offered by volunteers of Kanchi Periva Forum. We present this beautiful Bhajan "Aatkol Emai Sankaraa - Sri Periva Pancharatna Stotram" on Sri Maha Periva. Aatkol Emai Sankaraa - Sri Periva Pancharatna Stotram - Lyrics: Administrator, Kanchi Periva Forum. A humble submission at the Divine Feet of Sri Maha Periva by Kanchi Periva Forum Bhajan Group during Sri Maha Periva's Aradhana day event held at Mylapore Sri Kapaleeswarar Temple, Chennai on 02-Jan-2019. We are pleased to commence this new service, which is aimed at bringing out all devotional songs on Sri Maha Periva. We would be publishing and sharing songs performed by various members of Kanchi Periva Forum Bhajan Group along with detailed lyrics and notes, as requested by many devotees in the past. 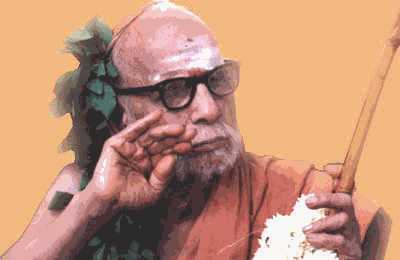 This service would be the one stop destination for viewing and learning all songs and keerthanais on Sri Maha Periva. You can also write to us if you want to organize a Bhajan performance by the Kanchi Periva Forum Bhajan Group as part of any devotional programs. The Kanchi Periva Forum Bhajan Group team is spearheaded by Smt Thangam Sridharan, who is leading the show with her exceptional commitment and dedication to the cause of spreading the Periva Keerthanai far and wide. The group also has the active guidance and blessings of Padmasri Dr Gayatri Sankaran, who is the mentor and guide for this project. Sri Ravichandran (known by his pseudonym Sri Guru Maheshwar in the music industry) is one of the key pillars in this initiative - his contribution of composing and producing high quality music on Periva is phenomenal and is motivational to many other volunteers of this group. The Group has many more active volunteers and expert singers within the community - who have come together with no expectations and absolutely as a measure of volunteering and offering this as a service to Sri Maha Periva. You would get to see and know them in the team credits video embedded below - Smt Kamakshi Gopalan, Smt Usha Hariharan, Smt Mallika Chandrasekar, Smt Parvathy Sriram, Smt Vasanta Raman, Smt R Uma, Smt Kowsalya, Smt Chitra, Smt Mathangi and Smt Kanthi Krishna - these are some of our long standing volunteers, and are now building the team along with other new volunteers who keep joining now and then. Dr T R Aravindhan, a well known contributor and researcher in the Music circles, is one of the Volunteer-mentors for this group and he is focused on bringing out some of the most difficult and complex songs written on Periva by Asukavi, Vidhushi (Svargeeya) Smt Dharmamba Paatti of Kumbakonam.